Buenos Aires, Oct 11 : Extraordinary, imposing, phenomenal, unforgettable. Those are just some of the superlatives used by South American media outlets to describe Lionel Messi after the Barcelona forward almost single-handedly guaranteed Argentina a place in next year's football World Cup. Needing to win Tuesday's final CONMEBOL group qualifier in Quito to ensure their presence in Russia, Argentina defeated Ecuador 3-1, inspired by a hat-trick from their talismanic No.10. "(Coach) Jorge Sampaoli's team went behind in the first minute but turned the match around with three goals from Messi, whose performance was unforgettable," the Clarin newspaper said. The Ole online portal hailed Messi for leading the comeback with "the help of Angel Di Maria and Enzo Perez", who assisted in two of the goals. "Messi was imposing at almost 3,000 metres above sea level," it gushed. La Nacion attributed Argentina's qualification -- having begun the clash in danger of missing out on the World Cup finals for the first time in 38 years -- to "an extraordinary" Messi. 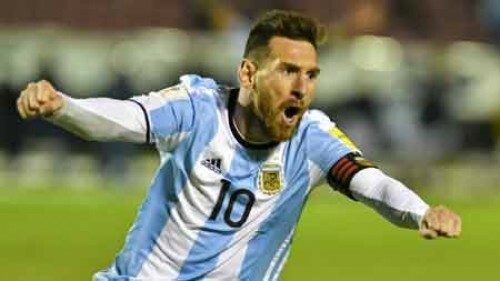 Arguably the most glowing praise came from La Capital in Messi's home city of Rosario, which cited the pre-match pressure on the 31-year-old to help Argentina break a four-game winless streak. "With an overwhelming Messi, Argentina beat Ecuador and claimed a direct ticket to the World Cup," it said. "The Lionel Messi that showed up was the one that everybody had been wanting to see. When the pressure was almost suffocating, the best player in the world made his presence felt. "The boy from Rosario carried the team on his shoulders and was responsible for changing the course of history with an extraordinary performance and three goals. He silenced the critics once and for all." Even Ecuador's press bowed to Messi's brilliance. The Universo said: "The organisers of the World Cup can now breathe easy. The Albiceleste qualified for the World Cup, imposing themselves in the altitude of Quito with a phenomenal hat-trick from the Barcelona star. The Quito-based Comercio newspaper added: "Messi was the best player on the pitch. Ecuador's defence couldn't stop him. He showed his magic as if he were playing at the Camp Nou." Messi's exploits also captured the attention of Brazil's media. "Argentina suffered an early shock but Messi put on a show in a 3-1 victory," media said.